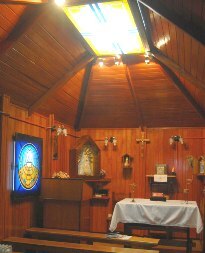 The Chapel of Base Marambio, Antarctica – W.A.P. 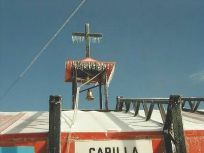 It was the 16th of April 1996 at Marambio Base when his Reverend Excellence the Military Bishop of the Argentine Republic, Monsignor D. Norberto Eugene Martina in solemn Pontifical, came to this Antarctic Station to bless and inaugurate the Oratory of the Cha pel dedicated to the Santísima Virgen de Luján. This solemn ceremony was presided over by the Air Operations Commander, Brigadier Rubén Mario Montenegro, while Military administrations, civil and special guests did attend the rite as well. Godfathers of this ceremony were the Head of Argentina Air Force’s General staff, General Brigadier Juan Daniel Paulik and his wife Maria del Carmen Luxardo Garcia de Paulik. The Antarctic Chaplain Father Nicholas Daniel Julian (picture here to the left) did participate in the construction and he builds of the oratorical. 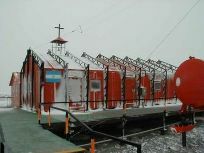 This, is one of the Churches built in Antarctica by the faith of people involved and it’s certainly a good sign to recall Lord and the Virgin in the white desert.